20 Series, M5 x 8mm Button Head Screw & Drop-In T-Nut w/spring-ball, TNUTZ Part #COMBO-020-B. This ad is for one kit (screw and t-nut). Extrusion shown in picture is not included in the ad, but shown as functional purposes only. These Combos are a great way to bolt things to your 20 Series T-Slotted Aluminum Extrusions. These are the suggested combination of screw and T-Nut for the 2 Hole Corner Gusset (CB-020-A) in our 20 Series Extrusions. These T-Nuts are bright zinc coated and perfect for mounting parts to 20mm or 5mm slot extrusions. The spring-loaded ball maintains the T-Nut in position in vertical applications. These combos DO NOT fit in the 80/20 20 Series extrusions. 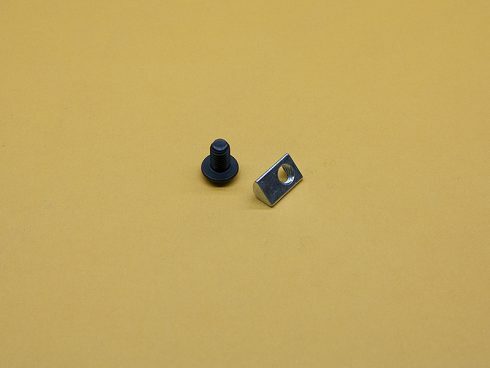 – These T-Nuts will also fit in most 5mm slot extrusions.